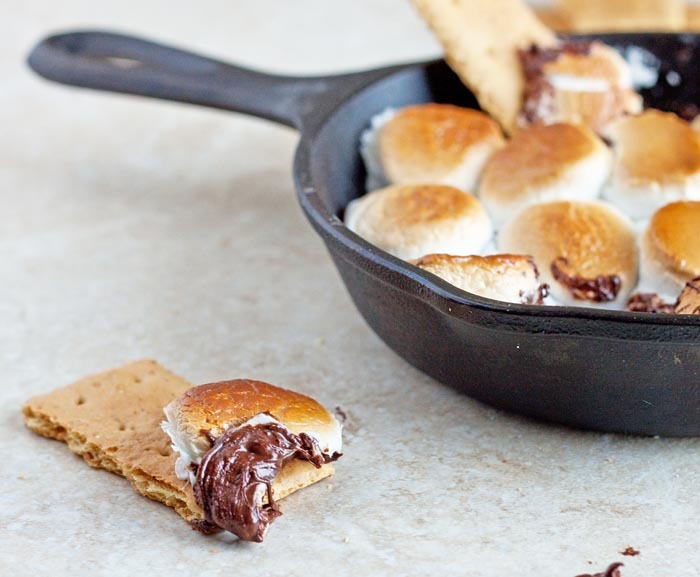 Indoor s’mores, baked s’mores dip made in a cast iron skillet. Scoop up with graham crackers and devour! Welcome to the original recipe on the internet for Indoor’s Smores, also known as S’mores Dip. There are many imitators, but this is the real deal! This is the second year in my life where I’ve had to deal with snow. Oh, sure we’d get a slight dusting of snow in Texas every so often. It would disappear almost as quickly as it came, but not before halting all civilization. Texans aren’t made for driving in the white stuff. If you’re driving in snow and see a Texas license plate, I beg you, please pull over and let them slide pass you. You’ll thank me later. In California, the winter is just foggy and drizzly with rain. I miss that cozy fog. But this Midwest snow? I just don’t know about it yet. If I could fast forward passed this winter and have it be summertime again, I would do it in a heartbeat for you. Let’s pretend the days are warm and the nights are just cool enough for a campfire. A campfire with s’mores! Wait, back to reality: we’re making s’mores in the oven today. With a cast iron skillet. Oh, yes we are! It’s called Indoor S’mores, after all! I used my mini 6″ cast iron skillet, just like I would if I was using an outdoor campfire instead of my oven. Fill it with your favorite chocolate chips (I used dark chocolate chips) and top with marshmallows. Bake in the oven until nice and toasty. Then, scoop it all up with graham crackers. 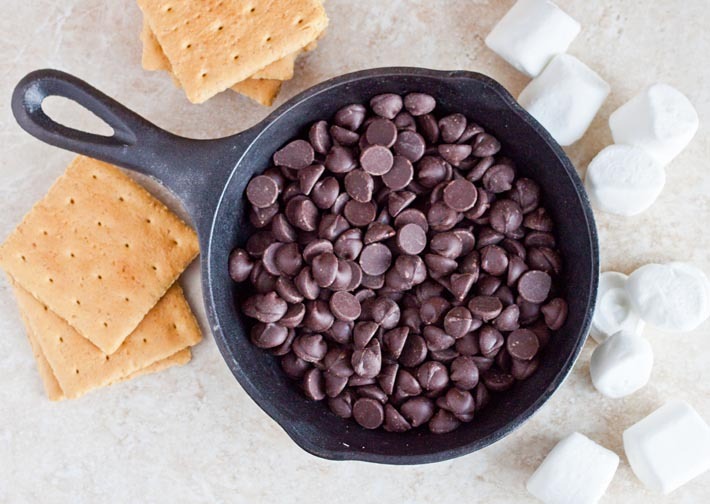 Let’s gather around the stove and pretend it’s a campfire, and scoop up this melted chocolate goodness and toasted marshmallow gooeyness with homemade graham crackers! You can use mini maple syrup marshmallows, large marshmallows, or even homemade marshmallows. All kinds of marshmallows are delicious. Fact. I hope this recipe for Indoor S’mores Dip warms you up in this cold winter season! I was inspired by my favorite magazine, Taste of the South. Did you seriously do this? True story — I just died. My sister and I have been talking about awesome desserts to make on New Year’s Eve. This is making that list. This might be the only thing on that list because really, why would I need anything else after this?! What Kristan said! Holy cow, girl. You basically just made S’mores Dip. Beautiful s’mores dip, at that. BRILLIANT! I love s’mores and hate having to give them up in the wintertime, living in NJ. Yum! Yes it’s cold. Yes I want indoor s’mores. Yes you are a genius. Yum. Man, it’s summer where I am! And all I want is snow! Maybe we swap? Either way, s’mores for sures. As much as I love the snow, I wouldn’t mind avoiding the crazy drivers and all the shoveling altogether for just one season. A perpetual summer would be find by me – bring on the campfire, outdoor shmooores, and sangria! My brain did a somersault when I saw the title of your post because I’ve been trying to figure out how to light a campfire in my oven for YEARS! Love this brilliant idea! These look soooo good!! You’re killing me with this! I’ve been looking for an excuse to buy one of those cute little cast iron skillets. I think I found it! This is a fantastic idea and I love s’mores! I love your indoor version of this summertime classic! Delicious! indoor smores sounds great. I am not a fan of winter either and I think living in Dallas it kind of spoils you. Hope you will get used to the weather there soon. Another great reason, and one of the main uses for my mini skillet: One box of Jiffy Corn Meal mix for cornbread. Six good-sized slices…with a couple tsp of sugar added, of course! Does it have to be large marshmallows. I’m just a kid and bought the wrong kind. Trying to get into baking. Sadly, people in WI aren’t the savviest snow drivers either. Let’s stay inside and pretend it’s summer instead! This is genius. It makes me hate winter just a little bit less! Oh my lord. You’re a GENIUS. I can’t wait to make this over the holidays! You’re cute. And so is this. I’m in love. Major love! What a fun snack and perfect for an indoor cold night! I love the new design too! Oh my god, this is exactly what I need right now! It is necessary in this weather! I am ALL on this!! Beyond GENIUS creation!! Don’t say I didn’t try to warn you. Ugh, winter. I’m so over it. Thank goodness for good friends with creative recipes. I found this on Pinterest & made this tonight! I don’t have a small skillet, so I used a large white ramekin instead! (Corningware) Worked great & my family loved it up here in snowy Canada. Thanks for a great recipe! Omg. Yes, yes, and YESSSS!!! So. Freaking. Smart. And easy! I love this! Brilliant! Now I have a use for my cast iron skillet! Now this is genius. Probably even better than real smores because the chocolate is fully melted and gooey. Going to have to get that cute little cast iron skillet so I can make this. Oh heck yea that looks incredible! No snow in my part of Virginia yet (thankfully!) but I LOVE this idea! 1) I don’t get nearly as much use out of my little cast iron skillet as I should, 2) I recently made homemade graham crackers. Done and DONE. Not sure I’d do well living in snow, I’m happy with the occasional dustings here. :-) These look so fun and delicious for a winter party, thanks! hihihi, your texans driving in snow story is very entertaining! Have to try this in our tiled stove during christmas holidays! My only question is – how’d u clean the skillet after? I’ve always been told never to wash my cast iron skillet to wipe it out pretty much………….. this looks yummy so please share how you cleaned ur skillet. I have seen so many recipes for indoor s’mores that leave me, well, cold, because they just don’t capture the essence of a fireside. But add a cast iron skillet and you have all the rustic makings of a fantastic winter’s night. I love it! Oh my gaw! It has been blustery and cold here in Baltimore. It’s all cozy sweater and slippers 24-7. If I don’t have to go out, I don’t. 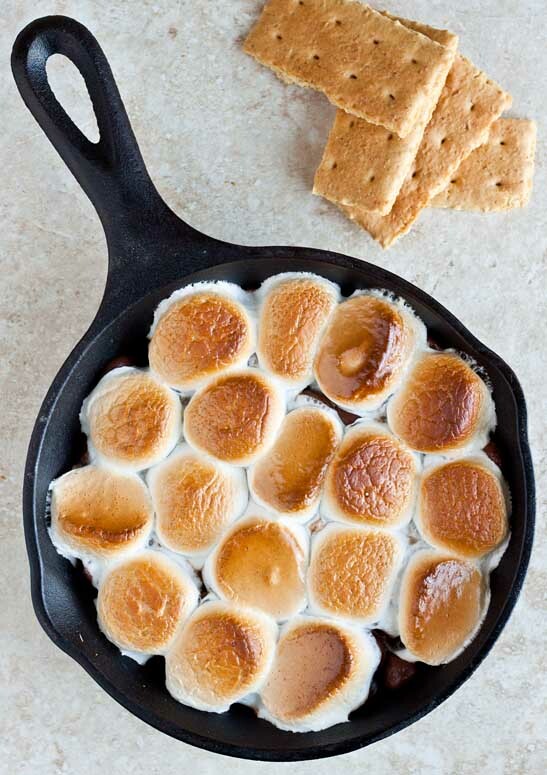 I wouldn’t mind getting cozy with this here s’mores dip. Yum! Oh my goodness!!!!! I need to try this! This = genius. And I am totally in love with the photos in this post. BUT… I don’t have a 6 inch iron skillet? What to do? This is such an incredible idea :) I can’t wait to try this!! whyyyyyyyyyy!!! now, i’ll be dreaming and drooling about this all night long. there goes my diet! Seriously genius!! I love this idea so much and can’t wait to try it! Holy Yum! Thanks for linking this amazing dessert up with What’s Cookin’ Wednesday! This looks absolutely amazing. A must-do for when real s’mores aren’t possible! OK so I made this for the Olympics opening ceremony party I was going to. But I was a little disappointed – the recipe is GREAT, and I love it….bt the chocolate didn’t ‘melt’ – it seemed to actually harden, almost as though it was being cooked TOO much, but I watched it very closely….it never got to that gooey consistency that you would want in order to be able to dip crackers into it. thoughts? I am wondering if it was too far towards the bottom of the oven when cooking….and the bottom of the cast iron heated up too quickly…..
Did you let them sit on the counter a few moments before eating? They need a few minutes to melt. The recipe calls for such a short time in the oven so that the chocolate won’t scorch. ALSO: the bottom of your oven is too hot! Your racks should be in the center of the oven always (unless a recipe says to move the racks). Did you say you made these and then took them to a party? The chocolate hardened while you drove over. They need to be served immediately. I will update my recipe to reflect this. Re using 6 inch cast iron skillet: I used a 6 inch heavy aluminum, coated skillet, worked great. However, be careful when it is first out of the oven – sugary stuff is really hot at first! Then, as it cools, it hardens a bit. No matter – use your spoon! I’m going to try it but since I’m the Only one going to eat it I used a mini iron pan (don’t know the exact name, you can tell I don’t cook lol) anyhow used chocolate chips and then mini marshmallows on top. I wasn’t sure if I was supposed to put chocolate chips back on top of the marshmallows the way as it sounds on here. The picture didn’t look like it so I didn’t. Can’t wait to taste!! Just saw this on Pinterest. GENIUS. LOVE. Way to put your cast iron to good use! As soon as I type this, I’m getting up from the couch and going to make them right now! I think these are awesome any time of day! Even 12:44 pm! Yummy lunch! You should have used “past” instead of “passed”. 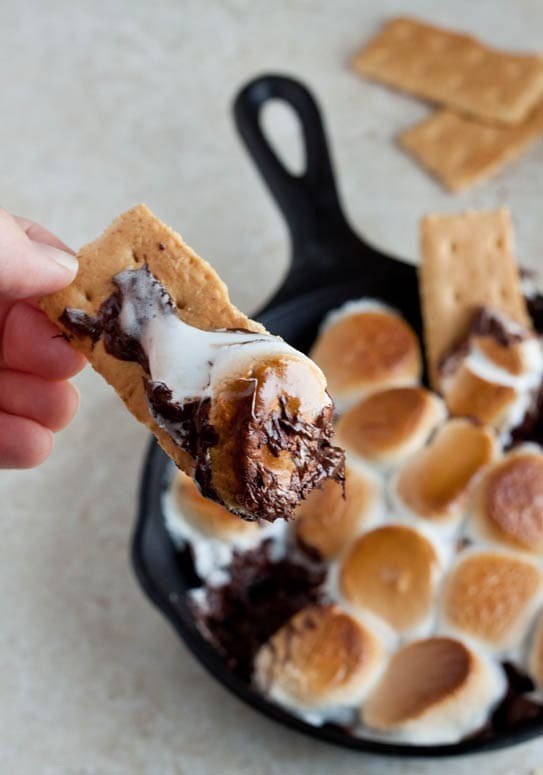 Love the idea of s’mores dip! I tried it the other day and I loved to dip the graham crackers instead of making a mess! I didn’t have a cast iron so I did a water bath with a heavy rimkin, to make sure the choc melted. The marshmallow texture was hard like when you microwave them :o( was not thrilled with the texture and you had to eat it immediately or the whole thing hardened. Luckily it’s summer so I tried this again but bbq’d the marshmallows and plopped them in the pot of melted chocolate! Yum. I would recommend pre-melting the chips. Once my marshmallows were nicely toasted – my chips were still solid. I did this in a larger skillet for 4 tween girls during their glam camp out in my TV room. They all raved but said it needed something fresh like raspberries, strawberries or bananas … interesting! Did you let it set after pulling it off the fire? The residual heat from the skillet will melt the chips. I’m not sure how well it works when the recipe is quadrupled, however. Raspberries sound awesome! Pingback: Today Is National S'mores Day! I used a 12″ cast iron skillet , cooked until the marshmallows were golden but the chocolate didn’t melt. Oven was at recommended temp. Why do you think this happened? Did you double or triple the recipe to make it fit in a 12″ skillet? Or did you use the same amount? The skillet needs to sit once it comes out of the oven to melt the chips. I doubled the recipe and I let it sit out after cooking to set. Not sure why they didn’t melt. I tried the recipe twice. Did anyone have any issues with it wanting to harden as it cooled? Im planning an outdoor October cowboy themed party for my 2 yr old I wanted to make this but I was afraid that after hitting the cool fall air it would just harden and be a mess. Any suggestions? Just picked up a cast iron skillet!! And I have a weakness for smores! I was just reading through the comments on this, I usually do just to see what others thought of the recipe, and since many said that the chips weren’t melted couldn’t you heat the skillet in the oven while it’s preheating? This was the chips have time to melt and the marshmallows don’t get hard after taking out of the oven? ehy can you not put the Graham’s at the bottom and then the chocolates and then marshmellows? I just found this and it looks great, so I will make it for my grandsons this week. I love problem solving so 2 things, if the chocolate doesn’t melt at first, why not put it on top of the stove over gentle heat. And to keep it warm, what about standing it in a electric fry pan on low heat. Also you say that you can use any kind of marshmallow, including homemade ones. My homemade marshmallows can not be heated. If you heat them, they turn back into liquid because unlike commercial ones there is no flour of any kind in them, just gelatin, sugar and water. The oven should melt the chocolate sufficiently. I can not answer about your recipe alterations, as I did not make the recipe your way. I made it as-written. My homemade marshmallows do not hold their shape either, but then you get a marshmallow layer instead of the actual shapes of marshmallow. You know what I mean? Instead of circles of marshmallow, it’s more like you spread marshmallow fluff on top and toasted it. It’s delicious. But it won’t look like the photo. We made these tonight and they were SO good! I posted the pic on instagram, thanks for sharing the recipe! 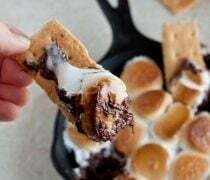 I just made these and they came out soooo yummy , soooo outright delicious loved every minute making these s’mores totally is going to do this again. Just came across your recipe on Pinterest as we were searching for new twists on a classic for Indoor Smores. This looks so delish for an easy recipe twist on a classic. We added you not only to our board but added a mention to this find with your link in our post today. Loved your site and will check back for more awesome inspirations. Thanks again! What else can I use if I don’t have a cast iron skillet? And if I use something else do I lower the temperature of the oven? WHOAA! Very cool, stay tuned :) !! Is it really takes only 11 minutes?Because everyday morning I am in a hurry for office. If INDOOR S’MORES takes only 10-20 minutes I will make it twice in a week. Going to save this recipe under my winter bookmarks. It looks absolutely amazing and I cant wait to try it. Definitely your Indoor s’mores are awesomeness! This is a great recipe Christina, as you know I made it a short while ago and it was lovely, in fact have made it again since. Thanks for sharing!